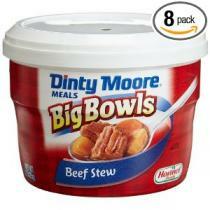 One pot camping meals are a great option for camping trips. There are many dishes that you can prepare outdoors quickly and easily using a Dutch oven, or other type of camping cookware, and a few basic ingredients. Franks and beans, sometimes referred to as beanie weenies, is one of the easiest one pot meals to make when you are camping. To prepare this simple, filling dish, all you need is a few cans of pork and beans and a package of hot dogs. Of course, you'll need a can opener to open the beans and a knife to slice the wieners into chunks. Place both items into a cast iron pot or pan and place on your grill, camping stove, or on a grate or tripod above an open campfire. Cook until heated through and serve. Nothing could be easier than that. You can give the dish your own unique flair by stirring in a few favorite seasonings. Consider adding barbecue sauce, mustard, or maple syrup for an interesting flavor variation. Homemade Chuck Wagon Stew is a popular one pot dish among campers. This dish is a flavorful combination of ground beef, chili beans, Mexican corn, barbecue sauce, corn muffin mix, and fresh vegetables. You can find a complete recipe designed for outdoor cooking on the Scoutarama website. Even novice campground cooks can whip up this tasty meal quickly and easily. Chili is a simple one pot meal. The easiest way to prepare chili during a camping trip is to use ground beef that you have cooked ahead of time at home and frozen. Simply crumble and brown the quantity of ground beef appropriate for the group that you will be traveling with. Drain the cooked meat in a colander and rinse so that all grease is removed. Place the meat in a freezer safe container such as a Rubbermaid or Pyrex food storage dish or a freezer bag. Place the bag in your cooler when you leave for your camping trip and allow it to thaw once you reach your destination. When the meat is thawed, place it in a Dutch oven or other large pot. Add canned tomato sauce and diced tomatoes along with a package of chili seasoning mix or the spice combination called for in your favorite chili recipe. Place the pot on the grill, camping stove, or on a grate over the campfire and simmer until piping hot. 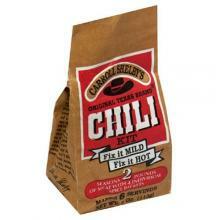 If available, sprinkle with cheddar cheese and sliced green onions and serve with saltine crackers. CampRecipes.com offers many choices of easy-to-make meal ideas for campers. KOA.com has an extensive selection of campground-friendly recipes, some submitted by campers and others provided by the company. RazzleDazzleRecipes.com is a great resource for camping recipes. Scoutarama.com contains many simple to prepare outdoor cooking recipes. Readers can also upload their own favorite camping meal ideas to share. Not all one pot meals have to be based on recipes that you make yourself. There are several canned foods that work perfectly for outdoor dining when simmered in cast iron cookware over a campfire or grill.